The AMMI is a 10-month intensive master’s programme that will begin this month at the AIMS campus in Kigali. Graduation for the first cohort is expected in June 2019. The African Institute for Mathematical Sciences (AIMS) Rwanda campus on Monday launched a new intensive foundational African Masters in Machine Intelligence programme in the country. Reportedly, the first of its kind in Africa, the programme is supported by tech giants, Facebook and Google. 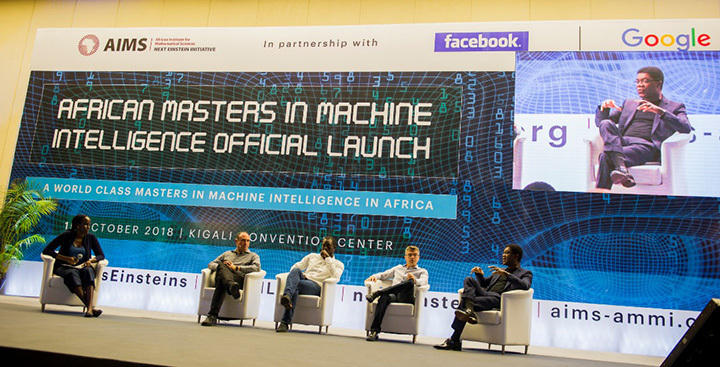 “We chose Rwanda because the programme aligns with the country’s goals to become a hub for innovation,” said Prof. Moustapha Cissé, Founder and Director of the African Masters of Machine Intelligence at AIMS and Head of the Google AI Centre in Ghana. Some 29 top experts, including Cissé as well as Marc Deisenroth, a lecturer in Statistical Machine Learning in the Department of Computing, Imperial College London, have already agreed to teach at AMMI making the programme the most unique of its kind in the world. Thierry Zomahoun, the AIMS President and CEO, earlier this week told the media that this programme is the first of its kind on the continent. “We made history today [Monday] on African soil; we launched a master programme in machine intelligence. It had never existed,” Zomahoun said. “No university has ever provided that training. It is extremely important for two/three reasons. Number one; artificial intelligence is going to revolutionalise every single aspect of our life. We have no choice. The wave is coming. And the wave is huge. Zomahoun dispelled concerns that artificial intelligence will be taking over human jobs. He said that it brings a win-win scenario, adding that machine intelligence technology will, for example, offer better diagnosis in healthcare. It is noted that AMMI will provide Africa’s talented scientists and innovators a world class foundational masters in machine intelligence, preparing them to think about new ways to solve local and global challenges. There is a lot of talent in Africa and the first successful students – from 11 countries in Africa – went through rigorous selection processes to qualify, Zomahoun said. There are two Rwandans in the first cohort of 35 students, 44 per cent being women – another first at AIMS. Most students come from a computer science or math blended education. While AMMI is the official name of the programme, students will graduate with a Masters of Mathematical Sciences with specialisation in Machine Intelligence. AIMS plans to expand the programme into other AIMS centres in the next academic year. Using the existing AIMS model, lecturers from all over the world will teach in two to three week blocks to provide students with the expertise without undue influence on their research choices.